Our cabin on the Columbia was a spacious 4-berth, with shower / WC pod and separate basis, which was clean and comfortable, if somewhat spartan. 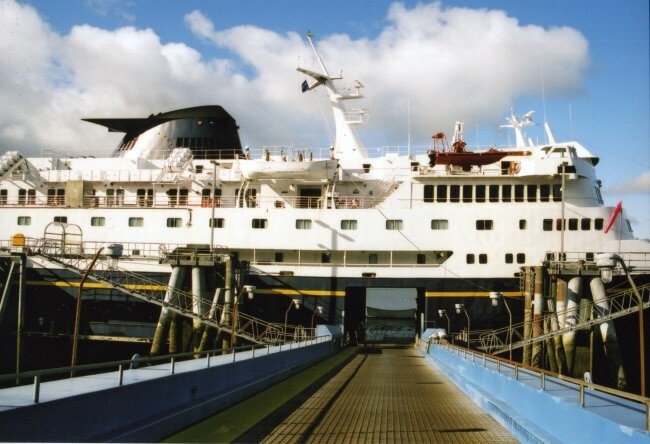 We quickly then set off to look around the ship, which was delivered in 1974 as the company�s new flagship, and significantly refurbished in 2001/02. With a capacity for 930 passengers and 134 vehicles, she offers passenger facilities spread over three main decks in functional but comfortable accommodation. 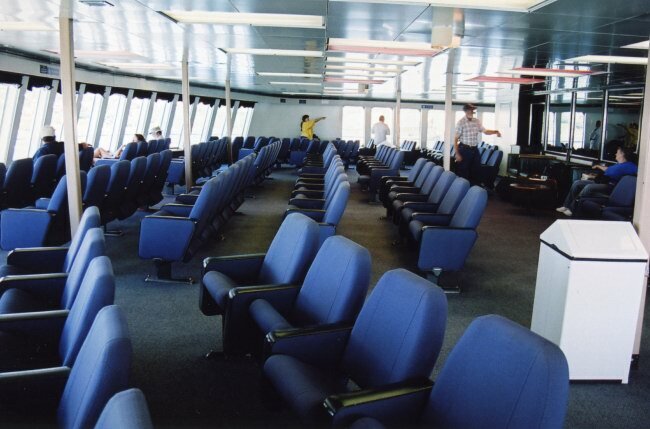 The Upper Deck contains cabins abeam of a central upper car deck, along with a spacious reception hall forward. The Cabin Deck starts forward with an observation lounge surrounding a central video / recliner lounge, and then cabins lead aft on either beam with crew accommodation centrally. 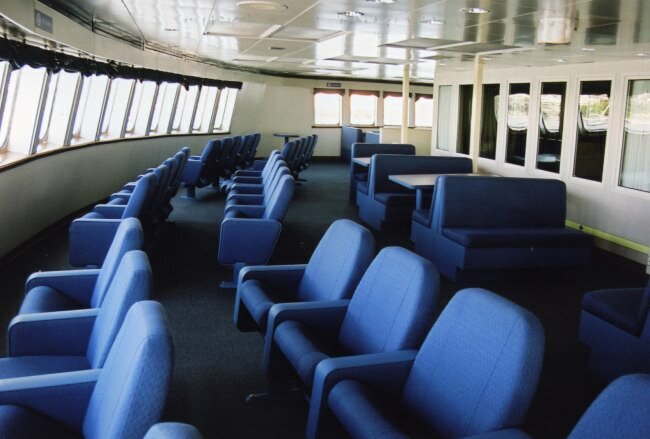 The main passenger deck, the Boat Deck originally included a full-width bar and dancing saloon forward, but this has subsequently been divided to provide an observation lounge right forward, surrounding an enclosed bar centrally. 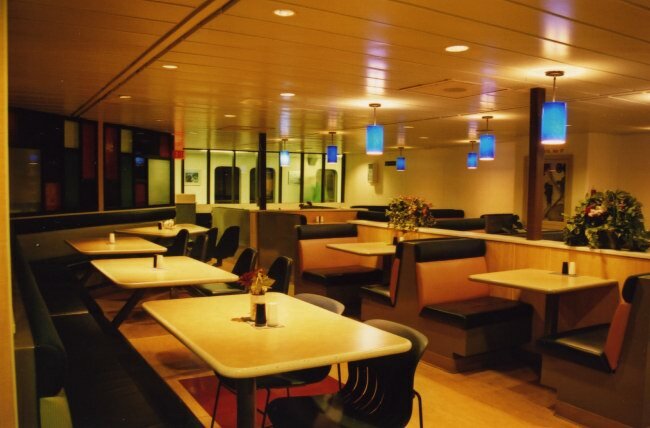 Whilst the majority of the accommodation dates from the 2001/02 refit, and is somewhat bland, the latter is a glorious survivor of her original 1970s d�cor, complete with red leather sofas, bright orange bays, black bulkheads and a spectacular ceiling composed entirely of huge circular lightbulbs. 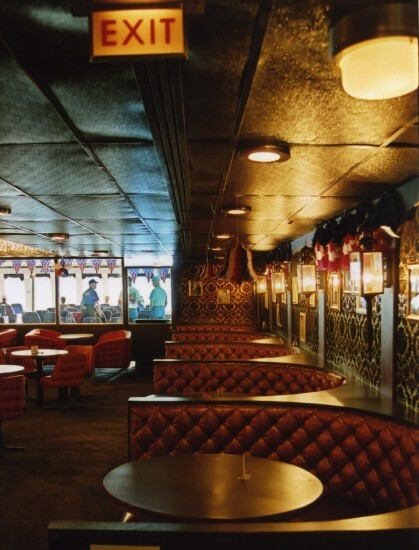 Aft of this, two narrow arcades lead aft, passing the Columbia Snack Bar amidships - a small cafeteria fitted with booth-style seating, and leading to the Columbia Restaurant aft. 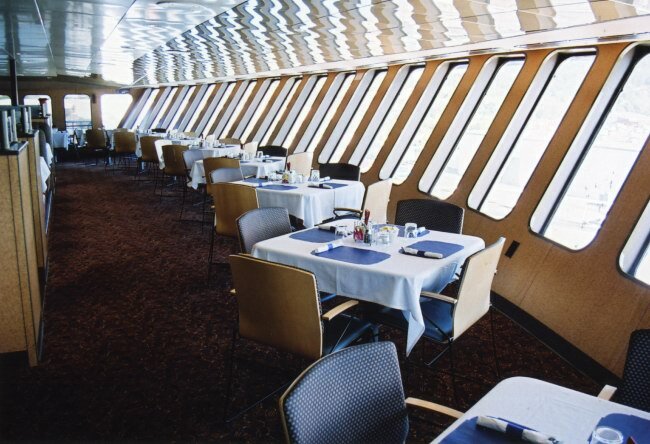 The latter is framed on three sides by panoramic windows, providing a superb view astern, and styled on the Sky Lounge on the former Stena Line vessel Wickersham, which the Columbia was commissioned to replace. 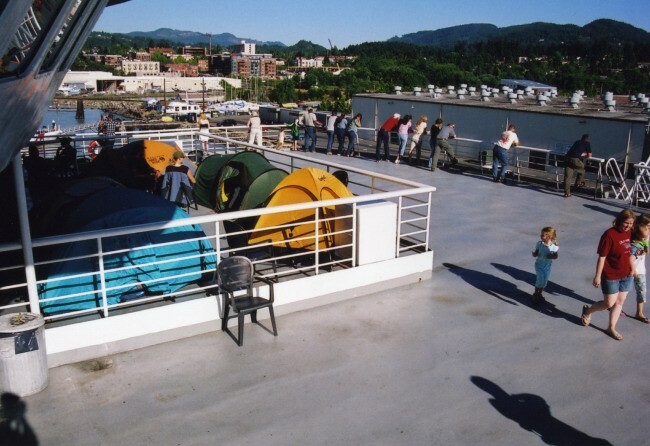 Above and below: Forward Observation Lounges on the Cabin Deck (above) and Boat Deck (below). 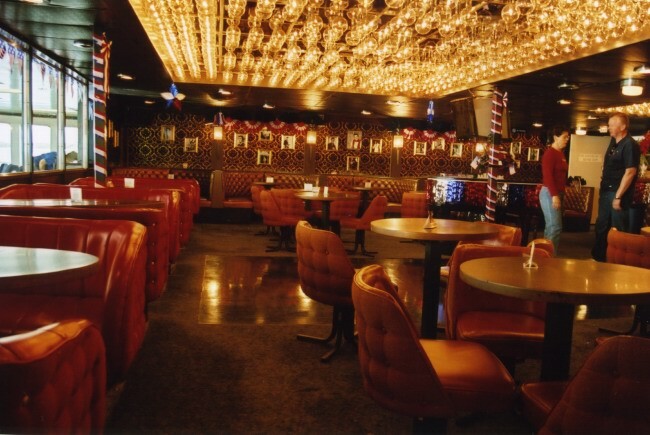 In the latter picture, the tinted windows of the bar can be seen on the right. We sailed from Bellingham, slightly late, but under glorious blue skies which provided wonderful views of the mountainous coastline, including Mount Baker. 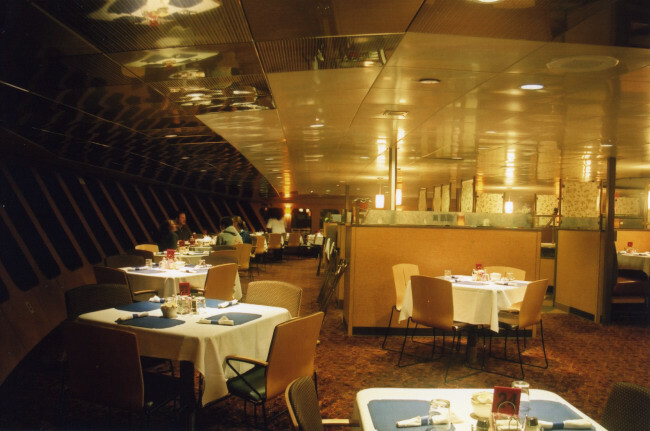 As the sailing progressed, we dined in the Columbia Restaurant, as the Columbia intercepted the BC Ferries� routes between the mainland and Vancouver Island. The menu offered a varied selection, including a wide choice of fresh fish, all reasonably priced. 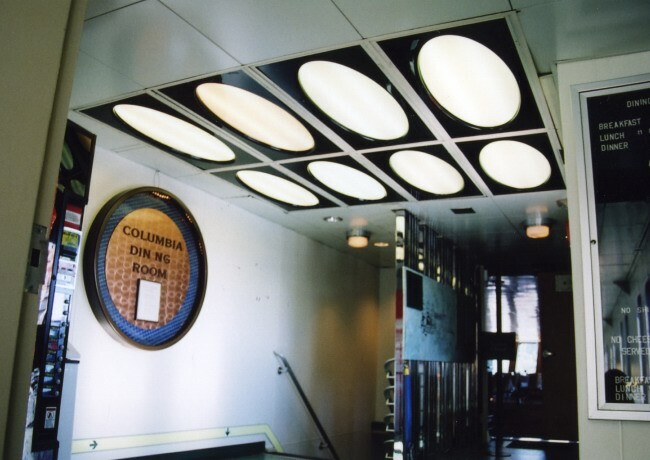 For passengers not seeking a full meal, lighter options were available in the Columbia Snack Bar. After dinner, we enjoyed drinks in the bar, which was ruled by a strict but sassy barmaid, who fiercely ensured that neither under-age drinkers were served, nor that alcohol was removed from the bar � which is forbidden onboard due to licensing laws. Sadly, she informed us that the bar was due to be refurbished soon, and the wonderful retro fittings will be lost � ironically just as that era is in vogue again. 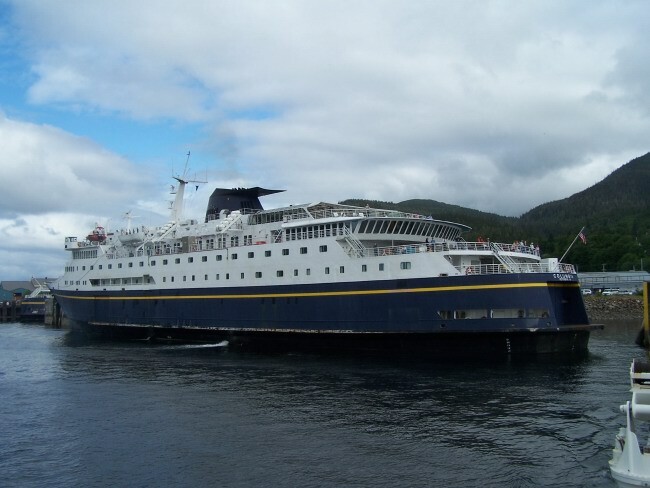 The purpose of the Alaska Marine Highway System is two-fold � it serves as an essential life-line for the Alaskan population, offering reasonably priced transportation to and within the 49th State, but it also offers an unpretentious tourist service for those seeking to see Alaska independently. The Bellingham route in particular serves today serves the tourist market, carrying rows of RVs North to tour the wilderness. Passenger demographics are mixed, stretching across a broad age-range and market, and accommodation onboard is tailored to meet this need. 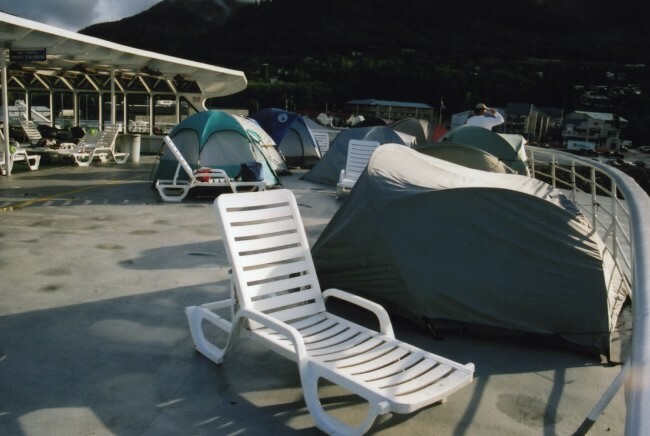 In addition to the staterooms and recliner lounges, heated semi-enclosed solariums are provided where passengers can sleep on reclining sun-beds, whilst areas of the open sun-decks are marked off for passengers to pitch their own tents. During boarding, while we had headed to our cabin, fellow passengers could be seen scrambling for the outside decks to reserve the best spots for the journey North, and these areas were quickly packed out. Above and below: The Columbia's incredible main bar. 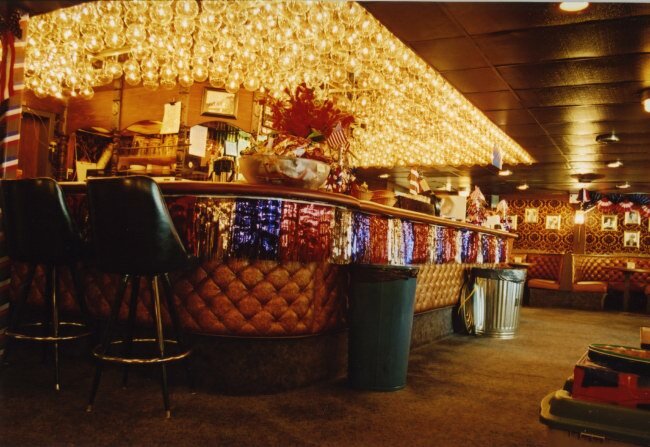 Above: The bar counter, decorated for 4th of July, including celebratory trash bins. 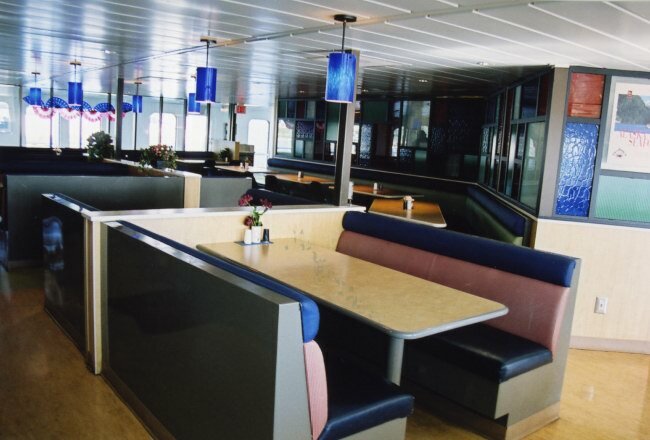 Above and below: The amidships Columbia Snack Bar, which was refitted in 2001/02. Above and below: ....now however, it has been pleasantly but forgettably refitted; the aft-sloping windows, seemingly inspired by the Wickersham, remain. Earlier in the trip we had encountered some rather sullen waiters who vigourously demanded tips; in the restaurants on the Alaskan ships however tipping was forbidden as it could be interpreted as a bribe to a government official! Above: Gone, but not forgotten. 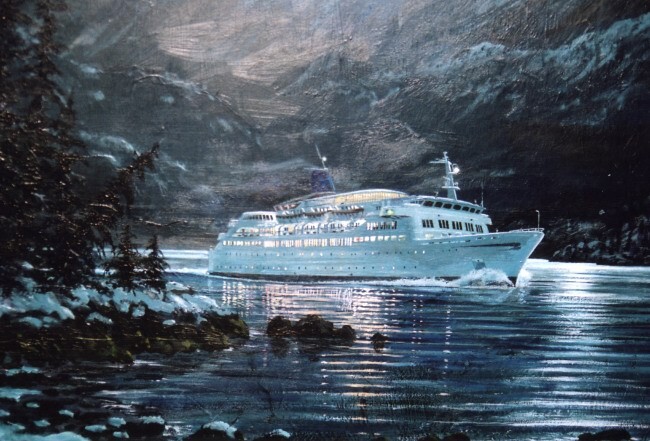 This painting of the controversial Wickersham, still in Stena Line white, graces the forward Boat Deck lobby. 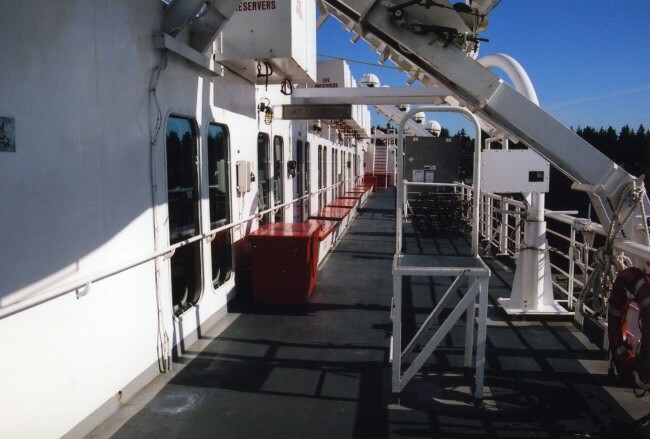 Above: Looking aft on the port-side promenade deck. Above and below: Camping on Board, Alaskan style.